This “grandfather” of the forests of the Sierra del Agua is a magnificent example of Corsican pine or black pine (Pinus nigra) that could be about 500 years old. Its trunk has a perimeter of around 5 m. It takes 3 people to fully embrace it. Its height is about 25 m. It has a huge side branch whose dimensions alone dwarf many other good specimens of pine around. The environment in which pine is has a truly magical touch. It is a sinkhole (karst depression) at 1500 m altitude, near the peak of the Gallinero (1629 m). Any of the routes into pine Gordo is itself an excellent trip itself. Go to the Pino Gordo. Sit under its shadow. Embrace it. Think about all the historical events that have occurred while this fantastic living being already was there! Protect it. Enjoy it. Love it! The Toril big pine hikes. It is the longest option. First you have to climb to Manojal. 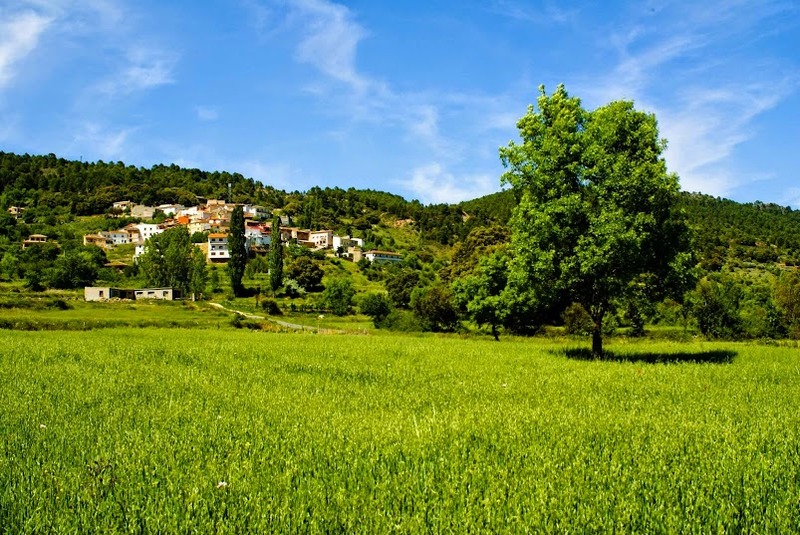 Once you’ll reach the the abandoned farmhouse of Manojal, the hardest part of the route will be finished and then you’ll move forward through a flat valley rich in meadows and forests of black pine. The end of the path is the same as option 2.